Most iPhone users are familiar to SMS handling by Nokia and Sony handsets and I'm currently coding an application for the iPhone which incorporates all of the features of said handsets to an iPhone but the 'job' and the 'hunt' is taking its toll on my time so I guess it'll be delayed. So I'm always suggesting that they use SMSD instead for the time being. And I've been receiving lots of queries on how to activate SMSD on the iPhone. Again, if you bother googling you'll see lots of how to's and not to's, save all that and the usual techy talk bull, most of the time iPhone owners will have a hard time to follow. There are terms like OpenSSH, setting permissions, BSD etc. Now you'll be thinking that you need a degree or something to make SMSD work, NOT! Just follow these remedies and you'll have SMSD working in a jiffy or if you're as lazy as Peter Pan in Xay's post, you can use WeTools instead. Thanks to google, amrut, modmyifone, hackintosh and Ricky Reyes for my hair, David's Salon for my make-up and of course, Cebuana Lhuillier for my jewelry, I love you Lucky! nyahahahahaha! I'm assuming that you've tried installing SMSD thru the INSTALLER application in your iPhone. And I'm betting that when you run SMSD it just crashes and reverts back to the springboard. 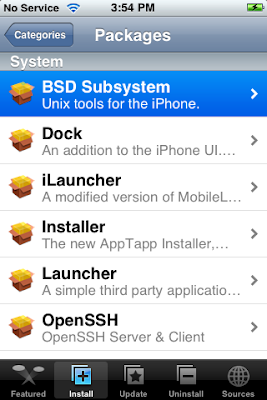 And I'm also assuming that BSD subsystem and OpenSSH is installed in your iPhone. Try checking if you have the said packages. If you jailbroke your iPhone yourself using Ziphone then you have those packages installed by default. If not, then install the packages. Location: INSTALLER -> install -> system. These are in order, meaning try the remedy #1 and if SMSD still crashes, try the next and so on and so, well you know the effin drill. 1. Uninstall SMSD, delete all text messages and conversations then hard restart your iPhone. Install SMSD again. Try. 2. If SMSD still crashes, download UiCTL. Location: Installer -> Install -> Utilities. 2.1 Restart your iPhone then run UiCTL. Scroll down to "com.amrut.iphone.SMSD" if it's not yet in bold black font then you have to load it, tap it and choose "load -w" Try SMSD. 3. Still not working, Uninstall SMSD then hard restart your iPhone. Go to INSTALLER -> sources. Tap "edit" then "add" this "http://install.ifon.no"
Download SMSD from INSTALLER -> install -> iFon Norway. Follow step 2.1 then try SMSD. There you have it, three simple remedies to get your SMSD working. Now that wasn't hard eh? Feel free to PM me or post your questions at comments and I'll answer them as soon as I get back and when I say back it means when I'm not under the effin influence of a hangover which I always am because that's what I'm paid to do err, I pay to have. Donated a friggin' beer already?